Prior to the signing period beginning Wednesday, the Seahawks learned two of their marquee free agents had agreed to deals elsewhere. Stay up to date with all the free-agent moves here. Free agency began March 14 when teams could officially begin signing players whose contracts had lapsed. We’ll keep track of it all throughout the rest of free agency in this space with daily updated looks at who is staying and going. CB Richard Sherman: Released by the Seahawks to save $11 million in cap space in 2018, Sherman turned around and inked a three-year deal with the San Francisco 49ers just over 24 hours later. TE Jimmy Graham: Signed a three-year contract with Green Bay ending a star-crossed three-year career with the Seahawks. 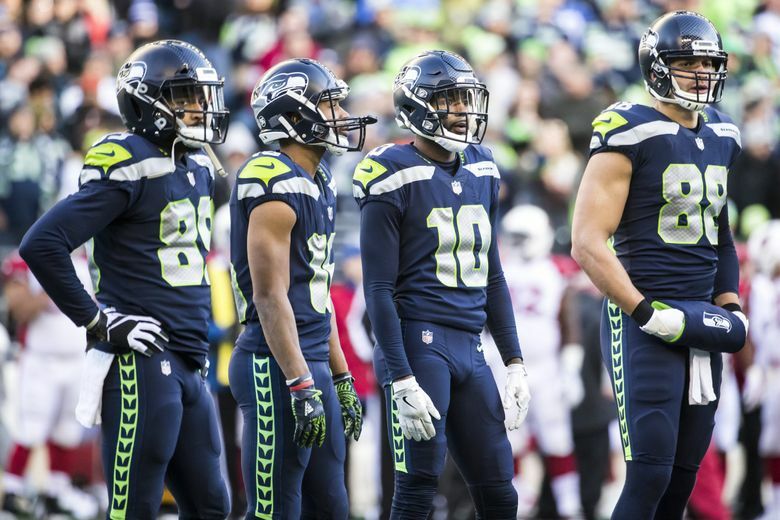 WR Paul Richardson: Seattle’s first pick in the 2014 moves to Washington for a whopping five-year, $40 million deal, or almost half-a-million dollars for each of the 95 receptions he made for the Seahawks in his four years. CB DeShawn Shead: Signed a one-year, $3.5 million deal with the Lions that can reportedly be worth as much $6.5 million with playing-time incentives. Detroit was Shead’s first visit, with San Francisco lined up next — interestingly two of Sherman’s top three teams before he signed with the 49ers. Seattle wanted to keep him, but this was also finally Shead’s chance to really cash in after battling a knee injury last year and having his unrestricted free agency status delayed by a year earlier in his career. DL Sheldon Richardson: Richardson signed with the Vikings on Friday. Richardson signed a one-year contract worth up to $8 million. OL Matt Tobin: Backup last season, signed a one-year deal with Patriots on Friday. Tobin signed a one-year deal worth $790,000. TE Luke Willson: Willson signed a one-year deal reported to be worth up to $2.5 million with the Lions on Wednesday. FS Bradley McDougald: Seattle re-signed McDougald to a three-year, $13.9 million deal on Monday in what is the team’s most significant signing so far and the only player who could have become a UFA the team has kept in the fold. DB Akeem King: King spent last year on the practice squad injured reserve. Listed as a cornerback he can also play safety and could be seen as a depth player at both spots in training camp. Was re-signed on Friday. RB Mike Davis: The Seahawks re-signed Davis to a reported one-year contract on March 22 worth up to $1.35 million. DE Marcus Smith: Smith agreed to a one-year deal reported to be worth up to $2.7 million on March. Smith had 2.5 sacks last season in a situational edge rushing role last season. DE/LB Barkevious Mingo: The sixth overall pick in the 2013 draft, Mingo signed with Seattle to a two-year contract worth a reported $6.8 million on Wednesday. He is expected to play as an edge rusher and potentially as a strongside linebacker in situational roles. He has nine sacks in five seasons and had two last season with the Colts. TE Ed Dickson: An eight-year veteran with the Dolphins and Panthers, the former Oregon Duck agreed to terms with the Seahawks on Friday on a three-year deal worth up to $14 million. According to ESPN, the contract includes $3.6 million guaranteed. WR Jaron Brown: A former member of the Arizona Cardinals, Brown signed on Friday to a two-year contract with a base value worth up to $5.5 million according to ESPN. S Maurice Alexander: A member of the Rams from 2014-17 before being released four games into the 2017 season, he was signed on Friday. OL D.J. Fluker: The Seahawks agreed to terms with the 2013 first-round pick and former Charger and Giant on March 20 on what is expected to be a one-year contract. Fluker is expected to start out playing at right guard. DT Tom Johnson: The Seahawks signed the 33-year-old eight-year veteran with the Saints and Vikings to a one-year deal worth up to $2.7 million on March 23. According to ESPN, Johnson’s contract has a base value of $2.1 million. DT Shamar Stephen: A member of the Vikings the last four years, Stephen signed a reported one-year contract with the Seahawks on March 24. ESPN reported the contract to have a base value of $2.1 million. OL Luke Joeckel: Joeckel was a fulltime starter at left guard in his first season with the Seahawks. But it’s unclear how new offensive line coach Mike Solari views him (former OL coach Tom Cable memorably said in a radio interview he thought Joeckel played as well as any guard in the NFL in 2016) and Seattle may explore other options to fill this spot. Simply put, he’s not expected back. RB Eddie Lacy: As big of a bust as there could be after signing a one-year deal with $2.865 million guaranteed, gaining just 179 yards on 62 carries with no touchdowns. Won’t be back. LB Michael Wilhoite: Had a serviceable year as a starting strongside linebacker and backup in the middle. But the team could also look for younger options than the 31-year-old Wilhoite. PK Blair Walsh: Isn’t going to be back and Seattle has already signed Jason Myers to as a possible replacement and is likely to sign or draft another kicker in time for camp. OL Oday Aboushi: Started eight games at guard before a season-ending shoulder injury. Could be back as depth though it’s hard to read what Seattle will do on the offensive line with Solari now in charge. LB Terence Garvin: Backup LB and also a solid special teams player a year ago but with Ken Norton back —- he’s the de facto linebackers coach as well as the new defensive coordinator — there could be some shaking up of the LB corps. QB Austin Davis: Played just two snaps all season but could return as the backup as he started eight games for the Rams in 2014 when new offensive coordinator Brian Schottenheimer was the OC with St. Louis. Seattle has also already re-signed Trevone Boykin, whose legal issues have also cleared up since the end of the season. CB Byron Maxwell: Played well down stretch in second stint with Seahawks and has said he’d like to be back and probably won’t cost much. (NOTE) Cornerback Jeremy Lane is also a free agent after being released. But because he was released he is considered a street free agent and would not be a factor in the compensatory draft pick formula. Seattle also has five players who are restricted free agents, meaning Seattle can give them a qualifying offer that means it can then match any offer the player receives or potentially get compensation if he leaves. If Seattle does not get a qualifying offer then player becomes an unrestricted free agent. Other teams have until April 20 to give offer sheets to RFAs. DE Dion Jordan: Seahawks placed a first-round tender on Jordan, meaning they will pay him $1.907 million in 2018 if no team is willing to part with a first-round pick to sign him. Seattle also has the ability to match any offer. CB Justin Coleman: Coleman signed his tender on March 28, assuring he will stay with the team in 2018. RB Thomas Rawls: Non-tendered by the Seahawks on Wednesday. Has been reported to have met with the Panthers and Chiefs. LB Dewey McDonald: Had ACL surgery after playing four games and was not tendered by Seattle. RB Jonathan Stewart: Former Timberline High star visited Seattle last week but signed on Tuesday with the Giants. RB DeMarco Murray: Visited the Seahawks on the first day of free agency but remains unsigned. DE Derrick Shelby: Former Falcon visited Seattle but re-signed with Atlanta on March 22. TE Austin Seferian-Jenkins: ASJ visited on Wednesday and left without signing, heading off to Jacksonville. He then signed a two-year contract with the Jaguars. LB Brian Cushing: Released by Houston, the former USC star visited the Seahawks last week but has not signed. DE Benson Mayowa: A member of the 2013 Super Bowl champs, he visited on Wednesday and is expected to have another visit or two. DE Tank Carradine: The former 49er visited the Seahawks on Friday and then signed with the Raiders after having visited Oakland earlier in the week. PK Caleb Sturgis: A five-year vet of Miami and the Eagles, he was reported by ESPN to have visited the Seahawks on Thursday. He visited the Chargers on Friday and then signed there. WR Markus Wheaton: The former Steeler and Bear was reported to have visited the Seahawks on Friday. WR Terrelle Pryor: A former quarterback who competed for the backup job for the Seahawks in training camp in 2014, Pryor visited the Seahawks on Sunday/Monday but with no decision yet made. Pryor then visited the Jets on Tuesday. It was reported on Wednesday that Pryor is down to the Seahawks and Jets as his final two teams. It was reported on March 22 that Pryor would sign with the Jets and a few days later he officially did. CB Dontae Johnson: A starter for all 16 games for the 49ers in 2017, he was reported to have visited the Seahawks. DT Bennie Logan: A former member of the Eagles and Chiefs, he started 12 games at nose tackle for Kansas City in 2017. DT Quinton Dial: The five-year vet of the 49ers and Packers visited during the first week of free agency. CB Kenneth Acker: A starter with the 49ers in 2015 and a backup with the Chiefs the last two seasons, Acker was reported to have visited on March 28. Seattle made qualifying offers to the following players, meaning they will be with the team in 2018: C Joey Hunt, RB J.D. McKissic, LS Tyler Ott, DE Branden Jackson and DE Quinton Jefferson.